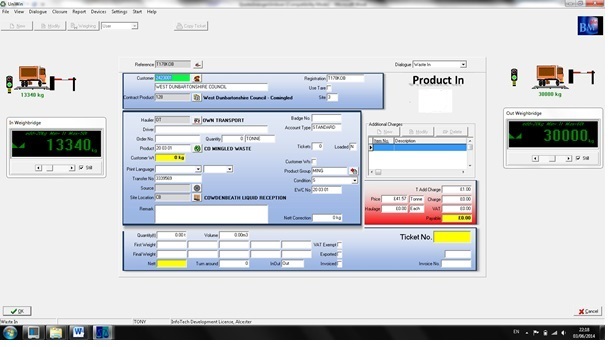 In the example to the left it illustrates two weighbridges being controlled by just a single PC that receives the orders from SAP and then sends back the transaction information. Once entered into SAP it will be invoiced and posted to an accounts software. 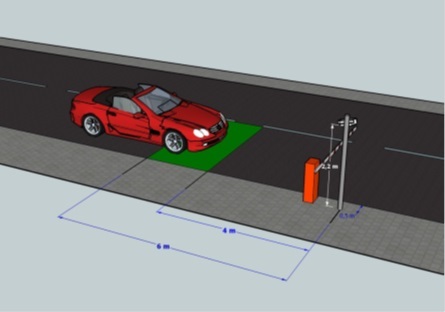 The software kernal has been built using the Uniwin weighbridge application and configured to meet all of the requirements that were specified by the company. The hardware was also supplied by Infotech and maintained by the customer or any other appointed infrastructure supplier; this also included any application or database servers. For collections the vehicle does not need to weigh into the site. 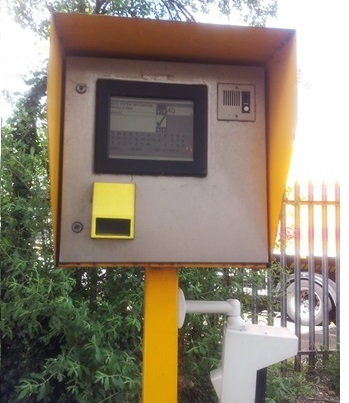 A vehicle will arrive at the site and providing that the weighbridge is clear, the vehicle will proceed onto it. The registration will be captured by an ANPR camera and then it will be displayed onto both the driver's panel and the office PC viewer. All known data about the vehicle from previous activities will also be retrieved and then the operator will add any additional information; confirm the details before pressing the weigh button to proceed with weighing the vehicle onto their site. An optional site map can be printed out. 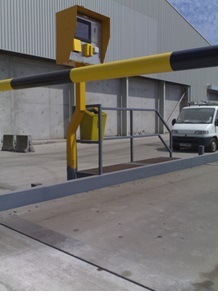 The barrier will then rise automatically and the vehicle will proceed to the loading or unloading point within the site. Once the vehicle has been loaded or unloaded it will return to the out weighbridge and again driving onto the weighbridge. The ANPR camera will again read the registration plate and display it on the driver panel. The operator will enter in any additional information and once happy accept the weight. A final ticket will then be printed. 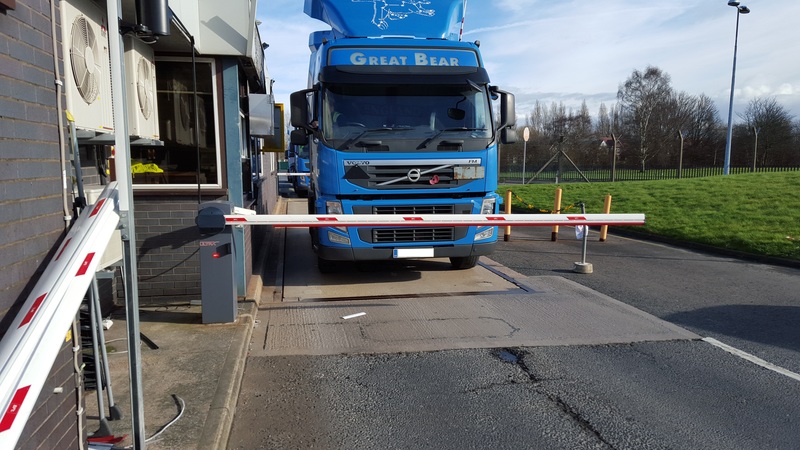 Finally the barrier will then rise for the vehicle to leave the site. A vehicle will arrive on the site and providing that the bridge is clear, the vehicle will proceed onto the weighbridge. The registration will be captured by the ANPR camera and it will be displayed on the driver panel and the office PC viewer. 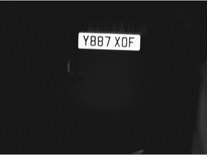 The driver will select a language, they then will confirm the registration, that was captured by the ANPR camera, and then enter in the SAP reference. All SAP data will be retreived and the vehicle will be weighed. An optional site map can be printed out. 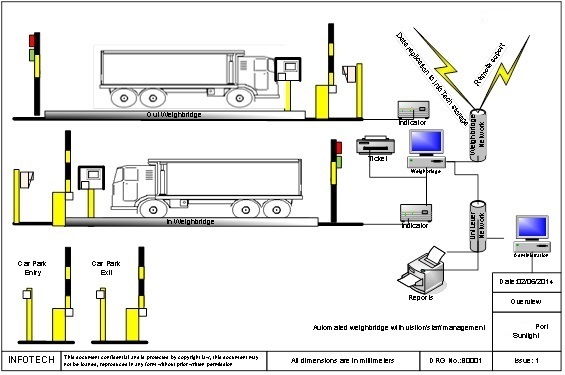 The barrier will then rise automatically and the vehicle will proceed to the relevant point within the site. The vehicle will return to the out weighbridge, again driving onto the out weighbridge when it is clear. The ANPR camera will again read the registration and display it on the driver's screen. Once the driver enters in any additional information, the vehicle weight will show and when the driver accepts the weight a ticket will be produced. The barrier will rise and the vehicle can leave the site. The image to the right is a screenshot of what one of the dialogues may look like. 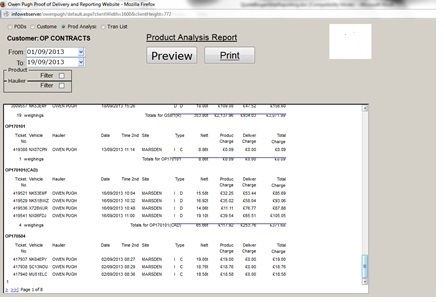 The software includes a web reporting facility, which approved clients can view their transaction information in the form of reports that can be viewed in a web page. Transaction listing with first weigh, final weigh, net and EWC codes. Just to the left are a couple of screen shots of what the user logged in will see. The images to the right show what one of our typical driver self-weigh panels looks like. 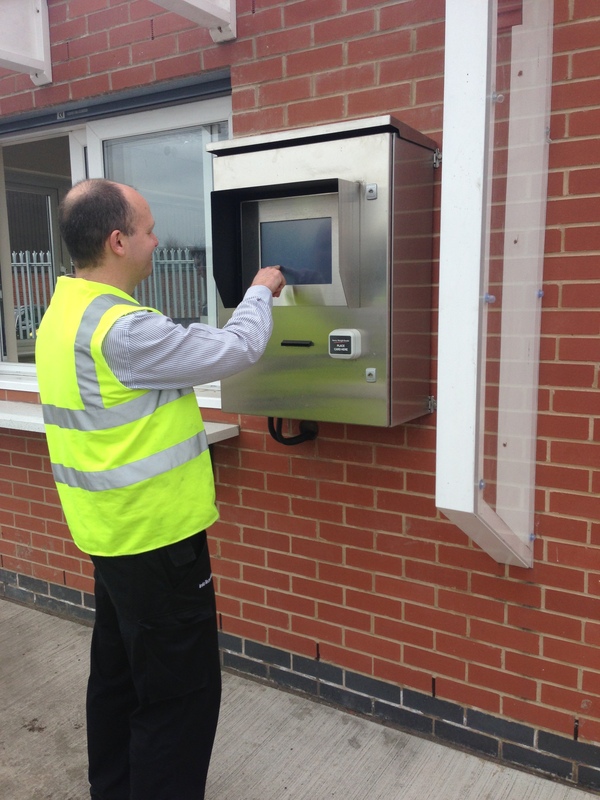 The panel consists of an industrial IP65 rated touch screen panel which is mounted into a stainless steel enclosure. The panel has a thermal ticket printer, an intercom and in this case study an ANPR camera for the registration plate reading. Also to the right is an image of what the touch screen would look like. The driver touch screen contains a QWERTY keyboard layout. Like a cash point machine, our touch screen driver terminal will ask the driver a single question at a time. 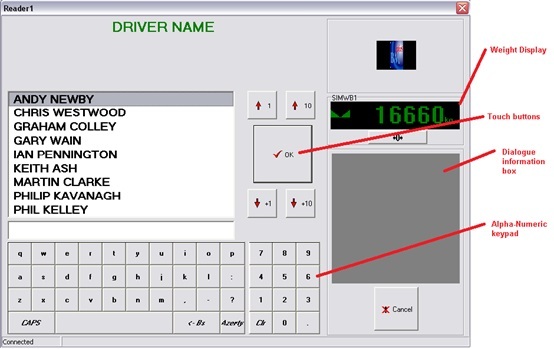 Upon answering, the next question will appear so that the software guides the driver through the weighing dialogue, making sure that each question is validated. Once validated, the vehicle is weighed and the data is stored in the main database. At any time the operator from within the lodge can take control and complete the transaction, should the need arise. 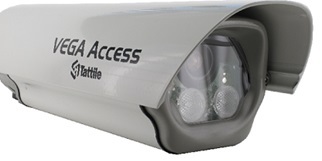 The ANPR cameras that were included in this case study are intelligent devices that will reside on the Infotech site network, upon detection of a vehicle the data including an image will be sent to the weighbridge computer. The image will be taken by an infrared camera and would be shown in the images to the left. 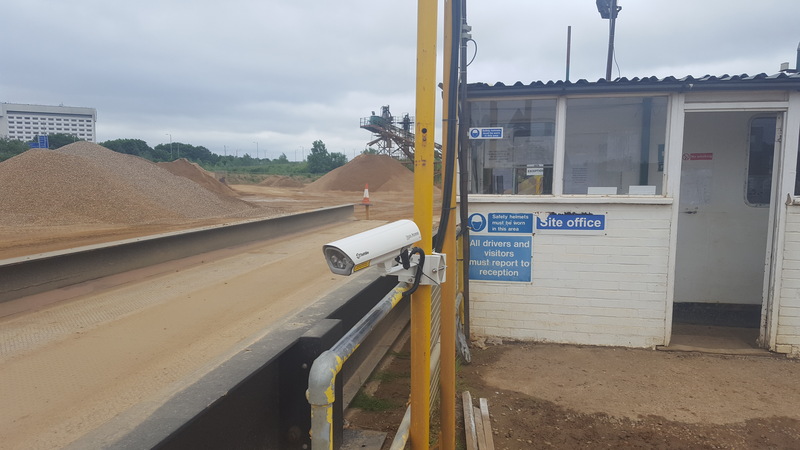 The vehicle will drive onto the weighbridge approaching the ANPR camera, once the camera gets a registration reading, the camera will then transmit the details onto the weighbridge PC where the registration number will be presented to the driver and the weighbridge operator as well.